Everyone goes into college hoping to find their best friend and excel in their classes, extracurriculars and jobs. With so much on our plates, we find ourselves making our best friend in the contents of our cup: caffeine. As a recovering coffee addict and a sleep procrastinator, I find myself reaching for my mug more often than most. I have learned, however, that everything is good in moderation. Luckily, this applies to caffeine too. If used properly, caffeine will help get you through your day, but it all starts with choosing the right form for your needs. Unfortunately, approximately 85 percent of Americans consume caffeine in one form or another every single day, according to a 2014 ScienceDirect report, making it the world’s most popular drug by far. 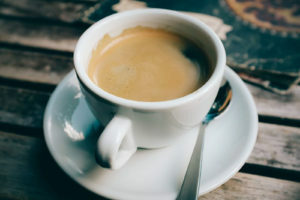 More than half of Americans consume about 300 milligrams of caffeine a day, Villanova University reported, which is an unhealthy amount for any one person. The “healthy” amount of caffeine depends on how much sleep someone got the prior night, and how much energy they need for the day ahead. From highest to lowest amount of caffeine, we can choose from coffee, black tea, green tea or none. In one 8-ounce cup of coffee, there are about 250 milligrams of caffeine. Whether it’s brewed or instant, coffee is the best choice for your busiest days. In fact, an 8-ounce cup is a healthy amount to regularly consume, especially with a low amount of added sugar, cream or milk. It is always better to reach for the dining hall instant than to go for a cup from *insert favorite coffee chain*. By limiting yourself to a small cup from the dining hall (or the hidden Keurig in your dorm), you are saving yourself money, time and added caffeine that you might not need for the day. If you are to hit up a nearby coffee shop looking for a caffeine boost, a drink with a long name and added whip is never the way to go. An important thought to keep in mind is that coffee is not just a morning kick or a weekday boost. A big misconception with caffeine is that it helps wake you up and keep your brain alert. In reality, it might be better to drink coffee on a day that you need the most physical energy, like going from one extracurricular to the other and maybe squeezing in a workout in between. If you’re drinking coffee because you think it might help you stay more focused in class, it might counteract your attention by making your hands and legs fidgety. If you’re buckling in for a studious day and you want to keep yourself calm in lectures, you might be better off with tea. Tea is what I like to call “brain caffeine.” The strongest kind of tea is black tea, containing about 45 milligrams of caffeine in an 8-ounce cup. While this is about half the amount that can be found in coffee, it might be just the right amount for a low pressure day. I have found that a cup of black tea is enough to keep you energized through a few morning lectures, and another cup at lunch or in the late afternoon will keep you focused on your work for the rest of the day. Spreading out cups of tea throughout the day might be the most effective way to distribute your caffeine intake because reloading according to your energy level will keep you consuming less caffeine than you would by drinking a single cup of coffee in the morning. If you want even less caffeine than black tea, green tea is an awesome choice. Not only does green tea have numerous health benefits such as improved brain function and even weight loss, it has about 30 milligrams of caffeine in 8 ounces to keep your energy level up and your heart healthy. The secret in green tea that makes it a “super” drink is catechins, or antioxidants, that help lower cholesterol, improve blood flow and even prevent cell damage. While green tea has less caffeine, it is perfect for a relaxed day of studying if you want to keep your focus — and your metabolism — up. The less caffeine you intake a week, the safer you’ll be from becoming a coffee addict with shaky hands and an eye twitch. Something I have found to help me lessen my caffeine intake is balancing the kinds of caffeine I drink each day by taking into account my daily schedule including my classes, extracurriculars and fitness (if I’m motivated), and consider how much energy I need for that particular day. The final piece of advice I can give you is not to let caffeine run your day. We will all inevitably load up on coffee the day before a big paper is due, and we will all need a cup of herbal tea to soothe us once that day is done. With that being said, choose wisely.